RICHARD LAMBERT. We first learn of Richard through the baptisms of his children in Deal. We do not have his own baptism, so we conclude that he was born outside Deal. His first known child was baptised in 1769, so we might guess he was born around 1745, in the reign of George II. MARY. Since we do not have the record of Richard and Mary’s marriage we do not know Mary’s maiden name. Their son was named William Corbet, so it is possible that she was Mary Corbet. We do not have a plausible baptism for her. Since her marriage has not been found in Deal, we assume her home parish was outside it. 1769 May 16 Elizabeth daughter of Richard and Mary Lambert. 1773 April 11 William Corbet son of Richard and Mary Lambert. Between these two is a baptism for Mary Lampert, daughter of Richard and Mary, on 6April 1770 at St Margaret, Canterbury. Since there are no other baptisms in Canterbury for this couple, it is possible that this is the same family. There are no more baptisms for children of Richard and Mary after 1773, leading us to suppose that Mary died soon after William’s birth. A Mary Lambert was buried in Deal on 21 or 23 Dec 1774, but she is not said to be Richard’s wife. On 11 April 1782 Richard Lambert married Sarah Knight in Deal, both of this parish. Richard signs his name but Sarah makes her mark. This may be a second marriage for the same Richard, or a younger man. We know from her burial record that Sarah was born in 1759-60. The most plausible baptism for her is in Lower Hardes, just south of Canterbury. This Sarah was the daughter of Joseph and Hannah Knight, baptised in 1758. Five baptisms followed for children of Richard and Sarah. There is a burial for Richard Lambert at Deal in 1792 Feb 25. He was 29. He was certainly too young to be the father of Elizabeth in 1769. He could be Sarah’s husband, though 19 would still be unusually young to marry. The balance of probability is that it was Mary’s widower who married Sarah Knight. 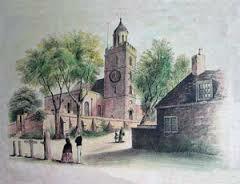 1795 June 28 there is a burial for Sarah Lambert in the family vault at St George’s, Lower Deal, aged 35. This is the first indication we have that the Lamberts were reasonably well off, though the sexton at St George’s records many burials in vaults. St George’s was the boatmen’s church. No convincing burial has been found for Richard.